A Unique and Beautiful Church Conversion Loft Previously Featured As Toronto Life’s ‘Rental Of The Week’! Just Steps To The Heart Of The Danforth And Featuring 1805 Sq Ft Of Space Over 3 Levels With Extensive Custom Finishes Throughout. The Main Floor Has Soaring 17 Ft. Ceilings, Tons of Natural Light, Silver Birch Hardwood Floors, Gas Fireplace, and Powder Room. The Chefs Kitchen Features A Granite Breakfast Bar, Stainless Steel Appliances, Pot Lights, And Ample Storage. The Family Room also has Hardwood Floors, 3 Piece Washroom, and Walks Out to a Private Stone Patio. 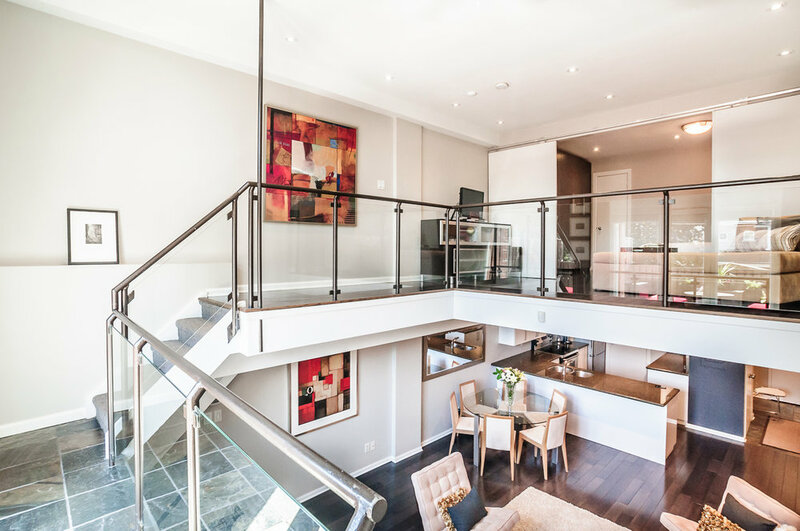 The Upper Level Is Accessed By A Glass and Steel Staircase Which Leads To The Open Concept Den Overlooking The Living Room, Private Rooftop Deck, And Spacious Master With Walk-In Closet And 5 Piece Ensuite. Just Steps to TTC Pape Station, Featuring A 96 Walk Score And Surrounded By The Best Shops, Restaurants & Cafes On The Danforth This Stunning Condo Complete With An Underground Parking Spot and Locker Is Sure To Impress!